After gaining a head start in the autonomous driving race, Waymo may do the same thing in the autonomous trucking space. For years, Alphabet's (GOOGL - Get Report) (GOOG - Get Report) autonomous driving efforts now known as Waymo were mocked by investors, journalists and observers. The technology was too far off and it was a Jetson-like idea. It would never work and was akin to money down the drain. Well, that's what they said. The company's efforts began in 2009 and now less than 10 years later, Waymo has become the leader of the autonomous driving movement. Multiple analysts pegged long-term enterprise valuations north of $175 billion -- no small sneeze, even for a company like Alphabet with its $850 billion market cap. Of course, Alphabet isn't the only car in the race. There's General Motors (GM - Get Report) and its Cruise division, while Ford Motor (F - Get Report) has plans, too. Daimler (DDAIF and Bosch recently announced they would use Nvidia (NVDA - Get Report) to power their autonomous mobility services as well. But Waymo has a big first step, proven by the service it's had running in Phoenix for about a year. Now, giving roughly 400 rides a day, the service is starting to gain traction. Despite this, many detractors to the autonomous driving movement still think the industry is many years away from getting up and running at a notable scale. Admittedly, full-blown level 5 driving will not be for sale for every day drivers by year's end. But Waymo's plans to order up to 62,000 Chrysler Pacificas from Fiat Chrysler (FCAU - Get Report) and 20,000 vehicles from Jaguar shows it has expansion plans -- big expansion plans. 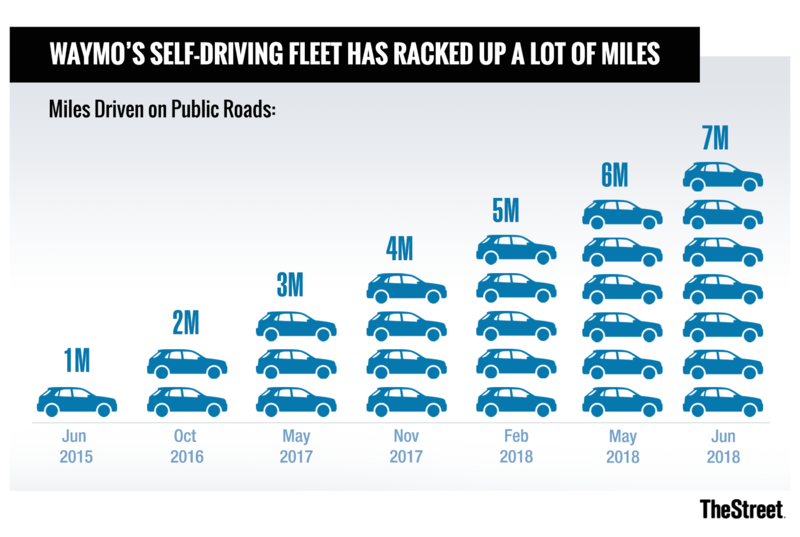 I recently spoke with Renovo CEO Chris Heiser, who said that only 5,000 to 10,000 autonomous vehicles would be needed for a city-wide rollout. That puts 10-20 cities on Waymo's map over the next few years, a figure he said "sounds reasonable" at this point in time. While autonomous cars and autonomous taxi services have been gaining traction, the autonomous trucking movement isn't so clear. The opportunity for autonomous trucking speaks to obvious benefits. Fleet management, efficiency and costs can drastically improve under automation. However, this also risks jobs and wages for those that depend on the industry as a living. The autonomous trucking industry gets much less attention than the autonomous driving and mobility-as-a-service industries currently do. That's as the latter is closer to the market than the former. Uber recently stopped working on its autonomous trucking ambitions, favoring the autonomous taxi service instead, given its main business is a ride-hailing platform. But that's not stopping some companies from pursuing trucking, Waymo included. A Waymo semi truck was recently spotted in Sunnyvale, CA., and it's not the first time. After all, Waymo is not just shooting for robo-taxis, but autonomous logistics solutions. We see this as it looks to leverage its technology in various ways -- be it with retailers, public transit and popular areas. That would include semi trucks, something the company is at least experimenting with. "We're really not a car company," Waymo CEO John Krafcik said in a recent CNET podcast. "We're building really great, really safe drivers that can be deployed in a lot of ways." While transportation (or mobility-as-service) is the first go-to-market task for Waymo, there are other focuses down the road. Krafcik explained that trucking and logistics is another key potential area for Waymo. The company put the same suite of sensors on a Class 8 truck and "it works very well with very little modification required," he said. Krafcik added that there will be more to come on that topic at a later date. So where does that leave us? We still don't know who will emerge as the autonomous trucking leader. But it would be unwise to leave Waymo off the list.